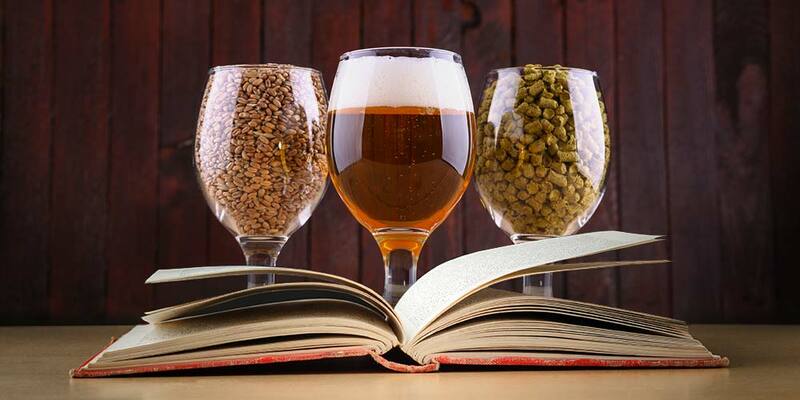 Brewing beer has been said to be part science and part art. There is a precise and calculated aspect to the process but at the same time the “rules” and any possible confines can be hazy, presenting grounds for personal interpretation and the creation of a truly unique beer. Sounds like it could be difficult, right? Well, it’s not. 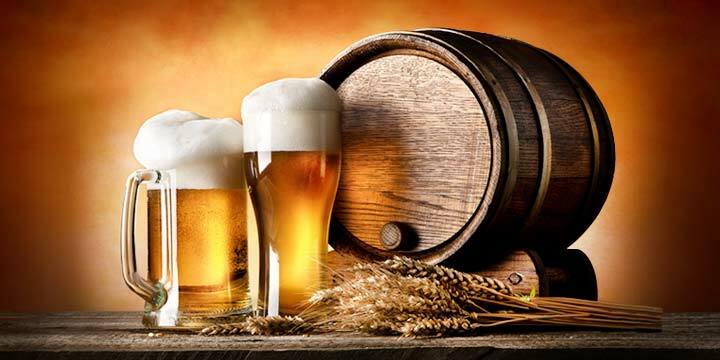 Brewing beer really comes down to a simple process that has roots as far back as 12,000 years. You essentially heat water and grain (and/or extract from grain), boil the mixture with hops, cool the mixture, ferment the mixture using yeast and then carbonate. Easy enough, right? Well, now we’ll go into a little bit more depth within each step. Once you have all of the necessary equipment, the first step isn’t actually brewing at all. First, you’ll need to thoroughly clean and sanitize ALL of your equipment. This step is crucial. Do not take any shortcuts here. Absolutely anything that will come in contact with your beer during the brewing process should be properly cleaned using an unscented mild detergent, then sanitized using a solution that is approved for sanitation, such as Five Star Star-San. I would recommend no-rinse varieties, as they simplify the process while remaining effective. 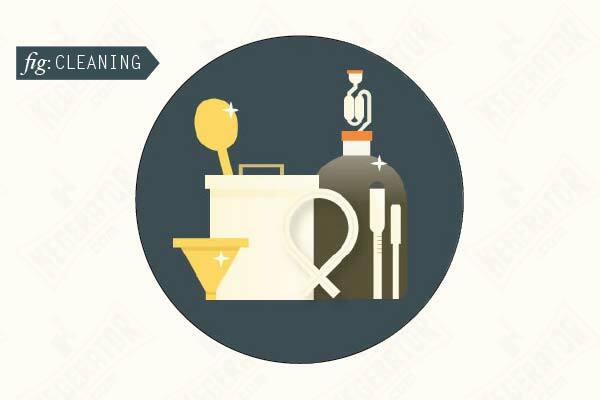 Once you’ve properly cleaned and sanitized your equipment, it’s time to get brewing! The brew is the step that requires the most direct attention from you for an extended period of time. This is due to the importance of having to follow a strict timeline and closely monitor the brewing process as it proceeds. This step actually consists of a few sub-processes, including mashing, lautering and boiling, all of which are equally important. Doing your absolute best to get everything right during this time is critical to the overall quality of your beer in the end. These critical brewing steps will form the base of your finished product. If you mess something up, it will undoubtedly have an effect down the line. 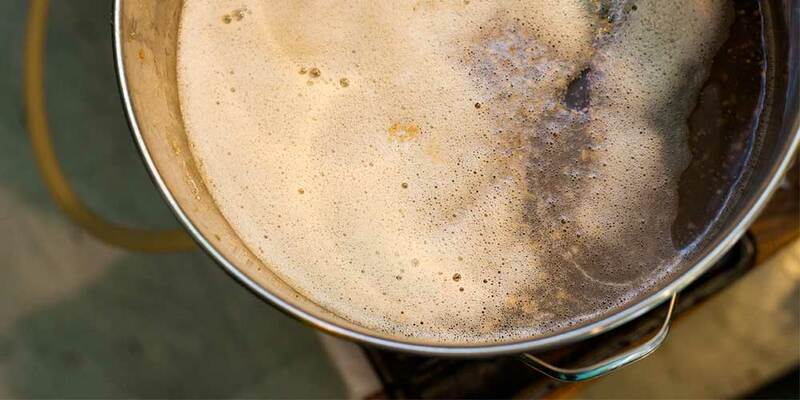 Keep in mind: As you learn how to brew beer at home, you will get it wrong the first few times. Do not let this discourage or demoralize you. It is important for you to understand that this is part of the learning curve, and everyone will make mistakes along the way. Take notes, recognize the mistakes and use these as learning experiences. 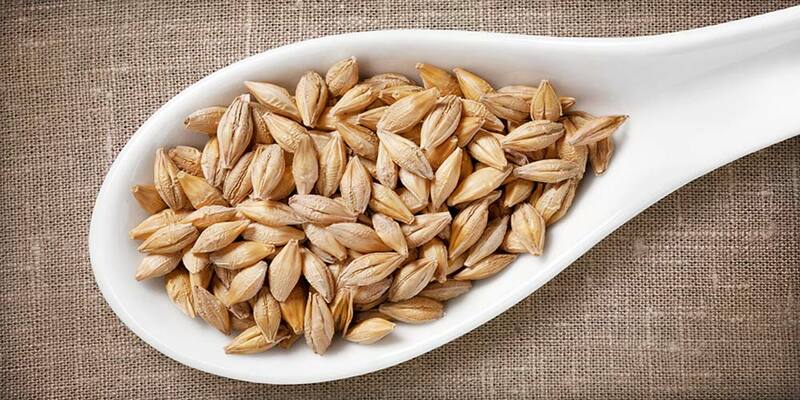 There are three main methods for brewing: Extract, partial mash and all-grain. As the naming would suggest, the methods mainly differ in how the base of the beer is created, among other aspects. Extract brewing simply uses extracts from the grains, whether in dry or liquid form, or a mixture of both, to form the base of the beer, known as “wort”. Extract brewing can also include the use of small quantities of grain to add depth to the beer, but overall the process requires less equipment, space and time, making it perfect for those brand new to homebrewing as well as novice and intermediate homebrewers. Though, even as some brewers learn and progress they choose to continue to employ extract brewing methods simply for the convenience factor. Partial mash, also known as “mini-mash”, brewing involves the use of malt extract as well as grain. The combination of both provides increased possibilities in the creation of the flavor, body, appearance and overall quality of your beer. This is a great second step for those that have successfully brewed with extract-only techniques, have a solid understanding of the process but want to take things further. At the same time, it doesn’t require much more time, equipment or space than extract-only brewing making the transition an easy one. Last but definitely not least is all-grain brewing. This is the purest form of brewing beer but requires more equipment and space (and subsequently, a greater financial investment), more time and an advanced knowledge of the brewing process. All-grain brewing does not use any malt extracts, so all sugars are pulled solely from the grains, which also provides complete freedom when creating your brew. In turn, it can also create more opportunities for mistakes to be made. All-grain brewing is only for the experienced brewer that has a solid understanding of the homebrewing process. 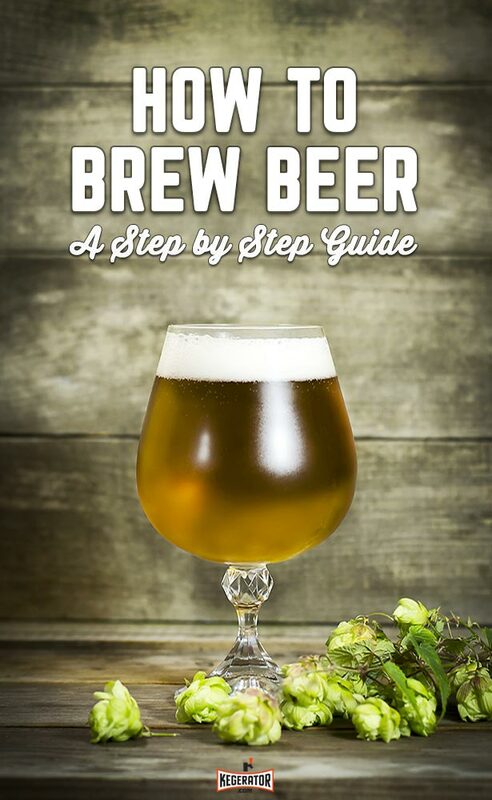 Now that you know the ways by which you can brew, let’s run through the steps. The first step of brewing beer is the mash, or mashing. The mash is the process of activating enzymes in the grain to change starches into sugar, ultimately providing the necessary “food” for the yeast. 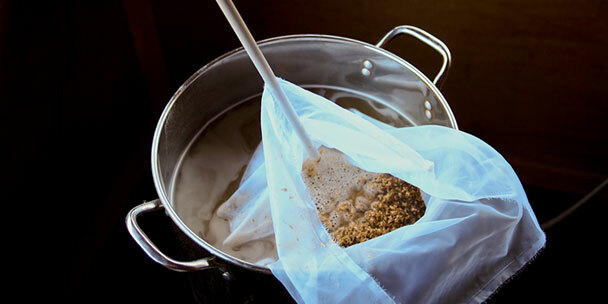 It will also create the base for the color, body and overall flavor of your beer. Mashing is somewhat similar to steeping tea. You will immerse your grain bill in hot water, allowing the heat to gently break down starches and activate the important enzymes within the grain that, ultimately, leads to those starches being converted to fermentable sugars. A few important things to be mindful of for the mash are water quality, temperature and stirring. The next step is lautering, which is the process of separating the wort from the grain. The purpose is to remove sugars that may be trapped within the grain following the mash. The reason for doing this is to get the biggest bang for your buck. 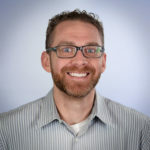 As previously mentioned, sugar is what feeds the yeast, ultimately converting into alcohol and making beer just that instead of non-alcoholic sugar water – the more food for the yeast, the greater the potential for successful fermentation. Lautering can be completed by various methods dependent on the type of brewing, but regardless of which method is used it will almost always involve a step called “sparging”. Sparging involves heating water in a separate container to a higher temperature than that of the mash, then pouring the heated water over the grain to “rinse” it of any remaining sugars. In more advanced brewing, this can involve extra equipment but follows the same general principle. The boil can sometimes be confused with the mash, but they are actually two very different processes. The mash, which converts starches into sugars, does not actually do so at a boiling temperature. However, the boil is appropriately named. The temperature is much higher than that of the mash (around 212°F depending upon altitude) and occurs over a longer period of time. The purpose of the boil is to destroy remaining unwanted enzymes, remove harmful oxygen and to stabilize the wort by lowering pH, ultimately creating the perfect environment for the addition of hops. Hops are a key ingredient in beer making and can be used in many different ways to achieve an even wider range of desired effects. Though, no matter what you’re looking for in the end, hops provide balance to the beer by adding bitterness to counteract the sweetness of the grain. 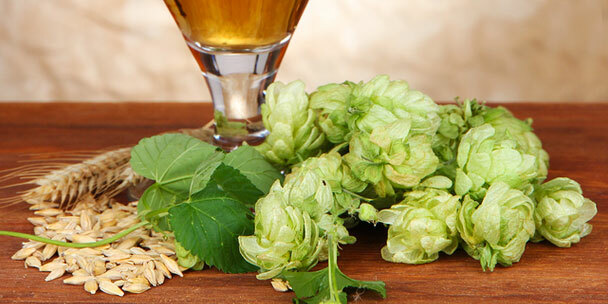 During the boil, hops can also be added at later increments to add flavor and aroma to the beer. 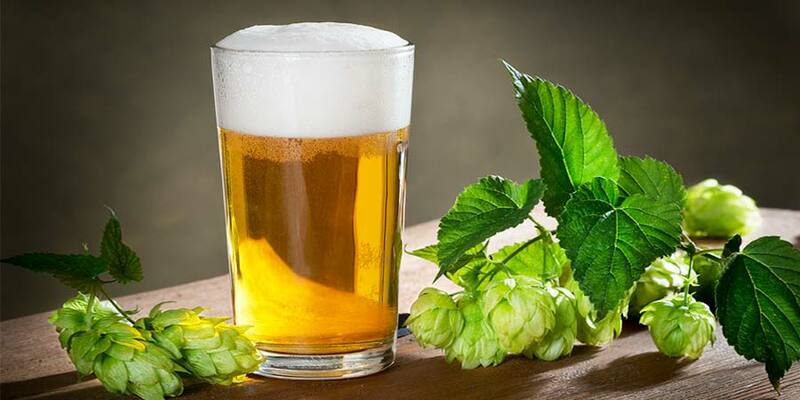 Hops also serve as a natural preservative that can protect the beer from bacteria and other potential infections. In all, the boil should create a healthy environment in which fermentation can successfully take place. With the brewing phase now complete, it’s time to prepare the wort for fermentation. This process involves quickly reducing the temperature of the wort, adding water, taking a gravity reading, then adding the yeast (also known as “pitching”). Once the boil is over, it’s time to cool the wort down as quickly as possible to prevent infection. The goal is to get the wort down to around room temperature in less than 20 minutes. Depending on how large your batch is as well as the ambient temperature, this could prove to be a straightforward task or a very challenging one. There are many ways to cool down the wort. When first learning how to brew beer, most homebrewers start with the most simplest method of cooling down wort — an ice bath. Depending on the size of your batch, you can fill your sink, bathtub or any other large container with cold water, and then load it up with ice. There’s no limit to how cold your ice bath can be – the colder it is, the faster you will be able to bring down the temperature of the wort. Once you’ve created the ice bath, slowly submerge the brew pot and then stir the wort constantly to more effectively distribute and dissipate the heat. When placing the pot in the bath, be extra careful to avoid splashing as you do not want any of the water to accidentally get into the pot. With the pot and wort at a very high temperature, the ice will most likely melt at a rapid rate, so add ice as needed until you reach room temperature. There are also more advanced and effective techniques for cooling the wort, such as wort chillers, which come in immersion, counterflow and plate varieties. These are well worth the additional investment as they are more effective in reducing temperature and can be used time and time again without ever having to worry about ice. While successfully cooling your wort down can be difficult at first, the good news is, as with everything in brewing, the more practice you get the easier it becomes. Now that you’ve cooled the wort, transfer it to a storage vessel for primary fermentation. This vessel should be large enough to hold the wort and, if necessary, the sterile topping-up water that you add. Once you have the proper volume of liquid, it’s time to take the first gravity reading. The reading will provide you with the wort’s specific gravity, which is its density in relation to the density of water. In the end, checking the gravity of your wort will help you ensure that you had a successful fermentation and will also allow you to calculate your beer’s alcohol content (also known as alcohol by volume, or “ABV”). 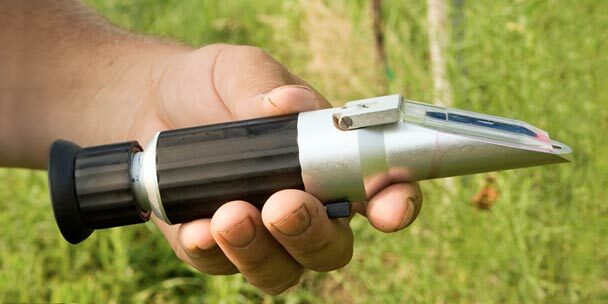 You can take your first gravity reading (also known as original gravity, or “OG”) by using a hydrometer. A hydrometer is a tool that is used to measure specific gravity. 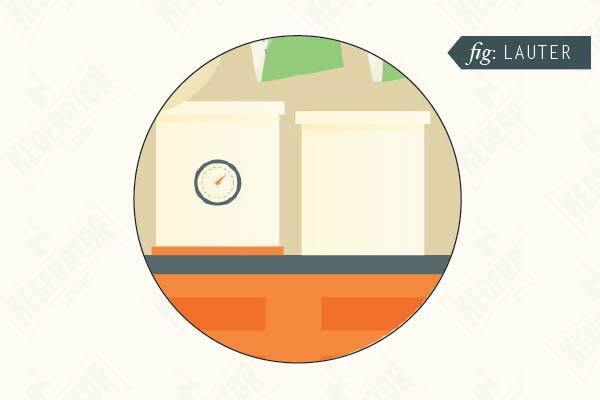 In order to take a reading, you must first retrieve a sample of your wort and place it in a container. A hydrometer test jar or cylindrical container that is similar in size will work best, and most hydrometers even come packaged in a tube that will work as well. Once you have placed the wort sample into the container, place the hydrometer in the container and make sure that it is fully suspended within the liquid. The line that the liquid matches up with is the OG. Record this number and make sure that you can reference it after fermentation is complete. Once you have taken your gravity reading, it is time to add the yeast. In the brewing world, this step is known as “pitching”. You want to first ensure that your yeast is ready for pitching, so before you even begin the brew, it is especially important to be mindful of yeast health. Make sure that your yeast is ready come pitch time by letting it sit out at room temperature for about 3 hours beforehand. Doing so will make for better fermentation and, subsequently, better beer. Brewing yeast (not the same as baking yeast) can come in dry or liquid form with each having its own advantages over the other. Use of each type is at the discretion of the brewer, but regardless of which type you choose to use, ensure that your yeast is ready for pitching. Dry Yeast — Commonly found in ingredient kits, dry yeast will not require activation but should be at room temperature. 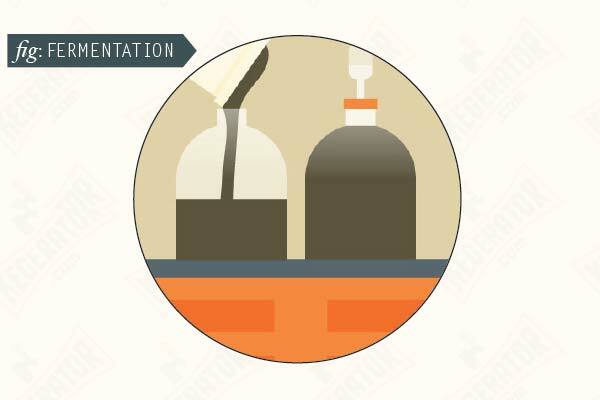 Liquid Yeast — Liquid yeast, on the other hand, will require activation by vigorously shaking the container and perhaps even creating a yeast starter prior to pitching. A yeast starter will simply prime the yeast for fermentation by allowing it to multiply prior to pitching. Once your yeast is ready, pitch it into the vessel that you will use for fermentation and aerate the mixture by stirring vigorously with a sanitized spoon or securing the lid and shaking the vessel. It is important to aerate the mixture because doing so reintroduces oxygen back into the wort that was previously removed during the boil. Oxygen is necessary for the growth of the yeast, which will ultimately complete the fermentation process. Now that the yeast has joined the party and the mixture is properly aerated, secure an airtight lid on the vessel and securely insert a sanitized airlock or similar blow-off valve that will allow CO2 gases to escape while preventing outside air from entering. The most important step in the beer making process, fermentation is where the magic happens. This is the critical time when the yeast converts the sugars into ethyl alcohol and CO2. While fermentation does not require uninterrupted attention like the brew, you need to keep a close eye throughout the entire period of time that it takes to complete the process. It is recommended that you separate fermentation into two steps: primary fermentation and secondary fermentation. The main purpose of primary fermentation is to allow the yeast to convert the sugars into alcohol and carbon dioxide. Additionally, the process will allow unwanted particles to sink to the bottom of the vessel, separating them from the beer. The collection of these particles is known as “trub” and is comprised of dead yeast cells, extraneous proteins and hops. This process will take roughly one week, dependent upon the style of beer that you are making. With the yeast in the mix, respiration must first occur then active primary fermentation should begin in about 12 hours. 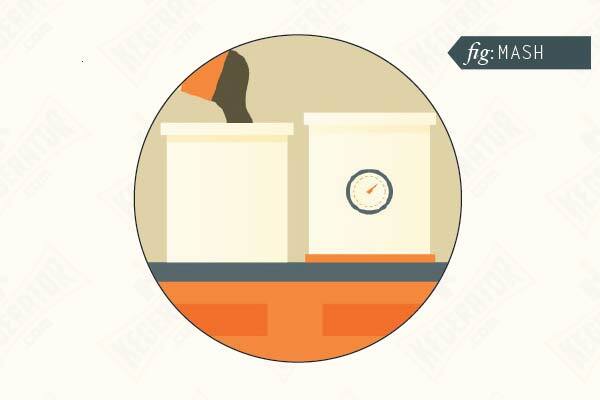 It is important to maintain a temperature around 68 to 72°F for healthy fermentation to take place. When active fermentation has commenced you will notice a release of CO2 gas from the vessel. 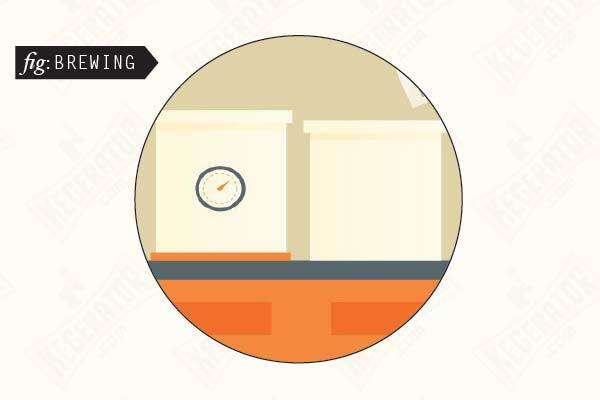 When using an airlock, you will notice bubbling within the airlock chamber. This means that the yeast is successfully converting the sugars. As bubbling starts to occur less frequently, this can be taken as a sign that primary fermentation is nearing completion. At this time you’ll want to transfer the beer to a secondary fermentation vessel. No. Secondary fermentation is not necessary, but provides a lot of benefits when you make beer at home. It is the stage in which the beer can further clarify and become more polished. However, if executed incorrectly, it can also serve as an opportunity to introduce infection and other factors that may have a negative effect on your brew. If executed correctly, secondary fermentation will result in a better looking and better tasting product. If you choose to skip secondary fermentation, simply allow the beer to ferment for 2-3 weeks in the primary fermenter. For those that choose to go for it, you will need to transfer (or “rack”, as it’s known in brewing) the beer from the primary fermenter to the secondary fermenter as carefully as possible without disturbing the trub or transferring the byproducts of fermentation that collect at the top of the beer, known as “Kraeusen” (kroy-zen). You will also want to ensure that anything that comes in contact with the beer is properly cleaned and sanitized. The primary fermenter should be located at a higher elevation than the secondary fermenter to allow gravity to do its thing when siphoning. If it is not, then you should move the primary fermenter 24 hours prior to racking to allow any sediment that could have been re-suspended within the beer to resettle. Rack the beer from the primary fermenter to the secondary fermenter while avoiding splashing the beer. You want to eliminate any possibility of reintroducing oxygen to the beer as oxidized beer can mean a stale-tasting beer with other undesired flavors. Once you have successfully transferred to the secondary fermenter, securely insert an airlock or blow-off valve and place the fermenter in a cool, dark place. While the more active stage of fermentation has already taken place during primary fermentation, some remaining fermentables and active yeast cells remain. Moving your beer to a secondary fermenter and allowing it to condition further will let the remaining yeast convert the more complex sugars and will ultimately improve the quality of your beer by increasing clarity, smoothing out the flavor profile and reducing the risk of infection and introduction of off-tasting flavors. The secondary fermentation stage is also typically when brewers choose to dry hop the beer. Dry hopping is the process of directly infusing additional bitterness, flavor and aroma from hops into your beer. Of course, dry hopping is style-dependent (more for IPAs and other hoppy beers), but secondary fermentation is an ideal time to dry hop because the vigorous fermentation and rapid release of CO2 has already taken place, allowing the oil and aroma from the hops to set in peacefully. You should allot at least one week’s time for the secondary fermentation phase to complete, but can certainly make it longer if you wish. 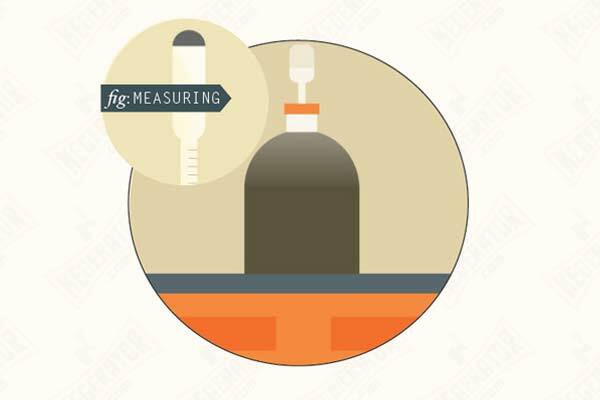 Once your beer has had ample time within the secondary fermenter, it’s time to take the final gravity reading, or “FG”. The final gravity will allow you to calculate exactly how much work your yeast has done during fermentation, and subsequently, your beer’s alcohol content. You will take your FG reading just as you took the OG reading, making sure that you continue to stick with the theme of proper sanitization. Once you have attained the reading, you can calculate the alcohol content by subtracting the FG from the OG, then multiplying that number by 131 – so, OG – FG x 131. Now that you know exactly how much alcohol is in your beer, you must be getting thirsty. Unfortunately, the beer is not yet carbonated and requires further conditioning, so you must decide how you want to store, carbonate and serve your beer. When preparing your beer for consumption, you must store it in an airtight vessel, allowing it to carbonate and condition. There are two main methods: bottling and kegging. 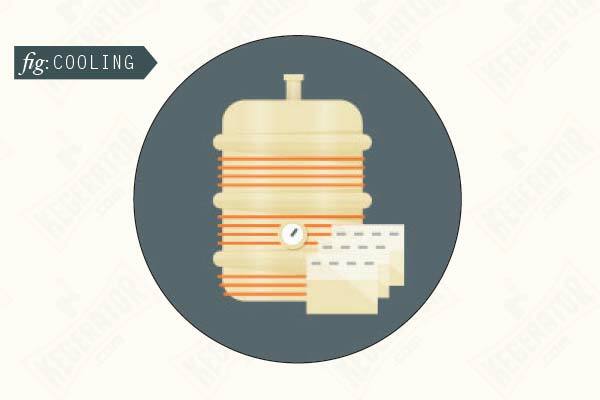 In homebrewing, bottling has long been accepted as the simplest method, but kegging has quickly grown in popularity, making a case as the better method of the two. Truth be told, there is no right or wrong way and each method has its own advantages. Bottling is an inexpensive option, making it the go-to choice for many homebrewers. Also, many equipment and ingredient kits come with all the items you will need for the bottling process. 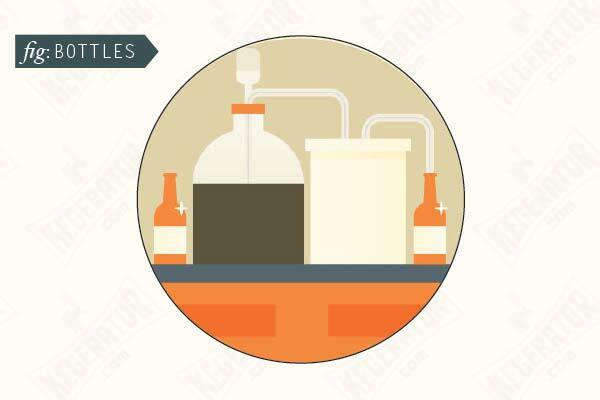 Most brewing equipment kits come with a bottling bucket, siphon, tubing, bottle filler, capper, a beer bottle brush and sanitizer – so, all you need to add are bottles and caps. And most ingredient kits come with priming sugar, and some even come with caps, too. 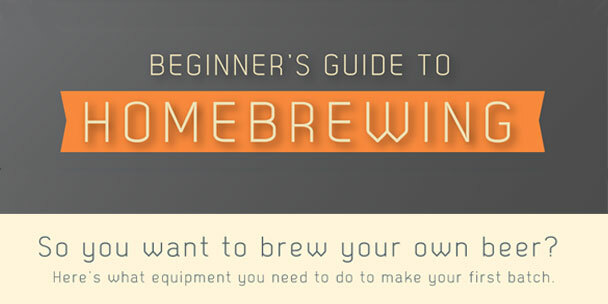 With many kits created with bottling in mind, it becomes an easy choice for homebrewers. If you decide to bottle your beer, you will need to follow these steps. First, properly sanitize everything that will come in contact with the beer. Then add the priming sugar to the empty bottling bucket. Rack the beer to the bottling bucket from the secondary fermenter, which will also mix the two. Then attach the tubing that you use for racking to the spigot on the bottling bucket. Attach the bottle filler to the other end of the tubing and begin bottling your beer by inserting the bottle filler into a sanitized bottle and pushing down. The bottle will quickly begin to fill and once the beer reaches 3/4 of an inch to the top of the bottle lift up the bottle filler to stop the flow. Then, place a cap on the mouth of the bottle and carefully cap the bottle by using the capper to bend the edge of the cap down around the mouth. Repeat all of the steps until your batch is completely bottled. Once the batch is bottled, store all of the bottles in a cool, dark place for at least two weeks. This allows the beer to go through its final conditioning phase and lets the yeast ferment the priming sugar to produce CO2 to carbonate the beer. After the beer has had time to condition and carbonate, chill it and enjoy! More and more homebrewers are choosing to keg their beer, as it is an overall easier and quicker process than bottling. Though, it does require a greater initial investment as you’ll need all of the proper storage, carbonating and serving equipment. At the minimum, you will need a keg, refrigeration box of some kind (typically a kegerator), a CO2 cylinder and regulator. You will also need the necessary lines, as well as a coupler or adapter to feed CO2 to the keg and dispense beer from it. A kegerator is typically the preferred choice for homebrewers, as it comes with everything you need. However, many homebrewers prefer to convert an old fridge or freezer into their own DIY kegerator, as well as use it as a fermenting chamber. This is something you may want to consider. If you decide to keg your beer, you will need to follow these steps. Just like bottling, you will want to properly sanitize any equipment that will come in contact with the beer. Once you have completed this, you can rack the beer from the secondary fermenter to the keg. Then you can seal the keg and connect it to the CO2 cylinder for carbonation. When kegging beer you do not need priming sugar to carbonate as you use CO2 to carbonate the beer. Actual carbonation levels are dependent upon the temperature of the beer you are carbonating as well as the desired volume of CO2 within the beer. 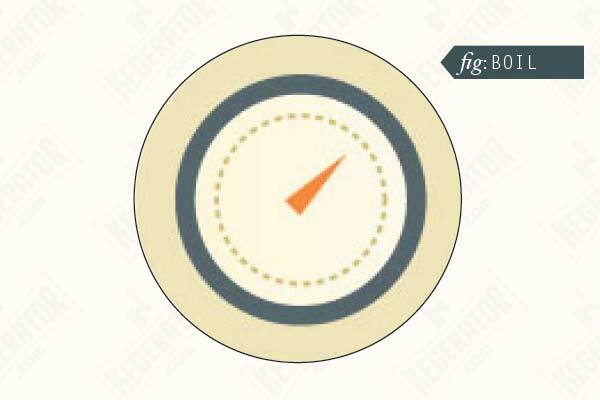 Once you have figured out the desired carbonation level, set the regulator to the appropriate PSI level and allow the keg to carbonate for at least four days. Once the keg is fully carbonated, lower the PSI for serving and enjoy! Great information to take you through the process of making “Gods’ gift to man.” Awesome site!! A very good and well laid out map for homebrewing. Although I have been brewing for over a year now I will be reading this again before each brewing session. Thanks. Your comment is old but I might as well answer for anyone who wonders. You can carbonate via priming sugar in a keg but you can’t push the beer to the taps without CO2.